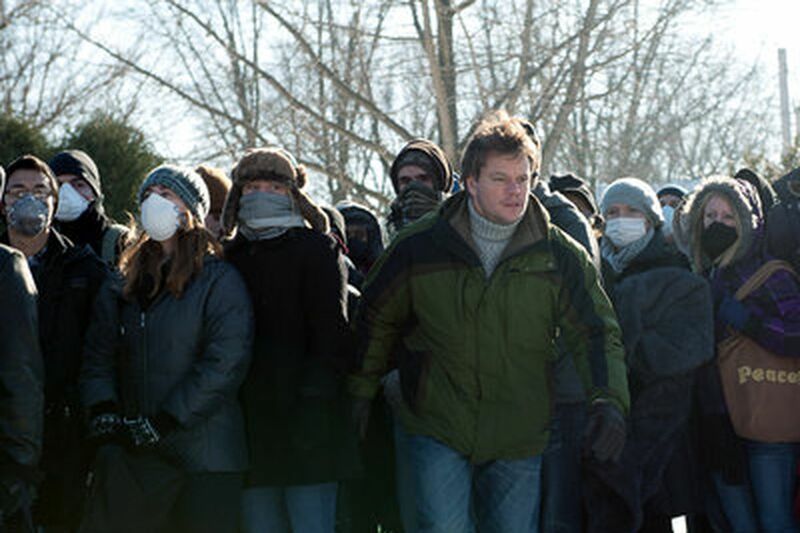 Contagion is the product placement dream-come-true for the hand-sanitizer industry. By the time this globe-hopping, movie-star-crammed disaster saga - directed with petrifying efficiency by Steven Soderbergh - comes full circle, you'll never want to touch a subway pole or elevator button or ATM again. In fact, you may not want to touch another human being - even the ones you live with. "Somewhere in the world, the wrong pig met up with the wrong bat," quips one of the epidemiologists busy trying to stop a pandemic that, with alarming speed, is laying low the citizens of Hong Kong and Minneapolis, London, and San Francisco, of anywhere and everywhere. Even Gwyneth Paltrow isn't immune. In the same crisp, cracking way Soderbergh moved from one continent to another, and one character to the next, in his 2000 drug-smuggling Oscar-winner Traffic, the director swoops in on the sick and the panicky, the government officials and the crackpots, as he tracks the course of a deadly disease. Paltrow is a businesswoman just returned from meetings in Kowloon. Back at home in suburban Minneapolis, and back with her husband, Mitch (Matt Damon), she suddenly feels feverish, weak, shaky. One minute she's trying to pour a cup of coffee, the next, she's on the floor, in the throes of a seizure. At the Centers for Disease Control and Prevention in Atlanta, Laurence Fishburne is Dr. Ellis Cheever, who dispatches one of his top staffers, Erin Mears (Kate Winslet), to Minnesota, where Paltrow's Beth Emhoff is just the tip of the proverbial iceberg. In the Bay Area, an aggressively loony blogger who goes around boasting of his millions of "unique visitors" is stirring up trouble by suggesting this raging virus is the result of a Big Pharm conspiracy. Jude Law plays this mad hatter of the blogosphere (his site is called Truth Serum Now) with nutty aplomb. However, his scariest pronouncement, at least to these ears, has nothing to do with mobs of violently unwell and dying people. It's when he's at the San Francisco Chronicle, pitching an editor on his story, and she turns him down. "Print media is dying," he snaps, exiting in a huff. "It's dying. I'll save you a seat on the bus." Paltrow, Damon, Law, Fishburne, Winslet, Gould . . . who else is facing down Contagion's contagion? There's Marion Cotillard, as a dedicated doc with the World Health Organization. There's John Hawkes, playing a janitor at the CDC. Demetri Martin and Jennifer Ehle are a team of scientists testing monkeys to try to find a viable vaccine. And there are cases of Purell, for those lucky enough to still be alive. at 215-854-5629 or srea@phillynews.com. Read his blog, "On Movies Online," at http://www.